Quilting prices don't include batting or backing. Everyone has their own preferences. You may provide your own batting and backing or purchase them from me. I use 100% cotton thread either solid or variegated. Binding service is available to finish your quilt. There are other sevices available. 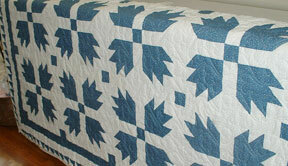 This type contains separate border treatments, individual block designs, sashing treatments, and stitch in the ditch techniques. This also includes following the blue dots on X-stitch quilts. You may purchase your batting from Country Home Quilting & More or supply your own batting. Just make sure batting is 6 inches larger on all sides of the top. I stock 100% cotton bleached and unbleached muslin in 90" and 120" wide backing fabric. Beds sheets are not accepted. 100% cotton thread is used in quilting your quilt. Most solid colors are available and many variegated colors. Thread is charged at $2.00 per bobbin. I prepare double fold French binding from customer's fabric or muslin used on the back. Binding is charged by the linear inch. 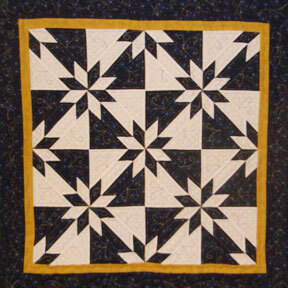 Linear inches are calculated by adding length x 2 plus width of quilt x 2 (ex. 80" + 80" + 180" + 180" = 376"). 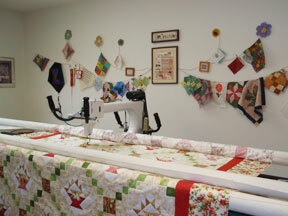 Most quilts need 1 yard of fabric for binding, and bias binding needs 2 yards (extra fabric will be returned with quilt). Shipping is either by USPS or UPS your choice. Shipping and handling is $15.00 per quilt plus insurance. I am not responsible for lost shipments. Please buy insurance to cover reimbursement of quilt. Do not use the word "QUILT" on the outside of the box where someone will see it and know what is inside. Address the box to Sharon Jack instead of Country Home Quilting & More. Send a $50.00 deposit or full amount if less with your quilt. Remainder due when quilt is finished before quilt is shipped. Borders need to be straight. Measure across the middle of the quilt for length and width of each border, this will make quilt straight. Don't just cut strips and sew them on from edge to edge. This can cause wavy borders. Stay stitch 1/8 inch around the outer edges of the top with no borders or pieced borders. This prevents seams coming apart due to tension in the machine. Make sure your backing is square, otherwise when pinned on the rollers it won't be straight. Make sure the backing and batting are 6 inches larger on all sides of the top. This is due to each piece pinned on separate rollers. Press seams and cut threads from top and backing. Mark the top and backing of the quilt with a safety pin if it matters which end is the top. Send a yard of fabric (2 yards if bias) if I am to make the binding for you (excess will be returned. Do not pin, baste or attach binding ahead of time.